Getting a credit repair merchant account is easier than you might think! Don’t let the fact that credit repair merchant accounts are being classified as high risk by many providers deter you from seeking credit card processing. Over the years, we have worked with hundreds of reputable and successful credit repair companies to help them obtain a credit repair merchant account. We’ve come to understand the credit repair industry better than most merchant account providers. Why did credit repair merchant accounts become considered high risk by credit card processing companies in the first place? As the demand for credit repair services has increased in recent years, so has the number of companies providing credit repair and credit restoration services. Unfortunately, some people entered the market with little or no knowledge of how to conduct credit restoration successfully. The high-demand also attracted fraudulent and unscrupulous people looking to scam customers. Providers of began to take losses on credit repair merchant accounts when merchants processed payments without delivering the results they promised customers. These bad-apples abused their ability to accept credit cards, which eventually caused the banks that underwrite the merchant accounts to classify the entire industry as high risk. Consequently, legitimate credit repair companies have found it increasing difficult to obtain a credit repair merchant account. 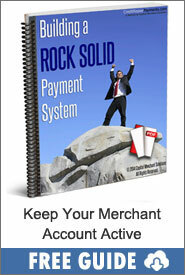 So how do you get setup with a credit repair merchant account for your business? The key is to partner with a provider that is willing to look past the stigmas surrounding credit repair and evaluate your business based on its own individual merits. It’s important to be absolutely sure your merchant account is setup specifically for credit repair or credit restoration services. Listing something vague on a merchant account application, such as “business services” or “consulting” may get you approved initially, but it will cause disastrous consequences down the road. An experienced and knowledgeable agent will be upfront with you about the fees and approval requirements. The false perceptions and stigmas surrounding the credit repair industry can be overcome. When done correctly, your credit repair merchant account will be setup with your unique business in mind, providing you with a reliable means of accepting credit cards for years to come.